Citation styles for electronic materials are continually evolving. In an effort to provide the most up-to-date citations for CQ Press's online documents, the editorial staff has created Citenow! This tool creates example citations for each document in APA, MLA, Chicago and Blue Book styles. CiteNow! citations can be exported to bibliographic software. Because the guides do not include a citation style that is directly applicable to the CQ Almanac Online Edition, the CQ Press editorial staff amended the online reference database style slightly to create a citation that includes all the information necessary to locate the material in the citation. Example: Border Security Clears During Recess, in CQ Almanac 2010, at 2-17 (Jan Austin ed., 66th ed., 2011), available at http://library.cqpress.com/cqalmanac/cqal10-1278-70356-2371493. Example: "Border Security Clears During Recess." In CQ Almanac 2010, 66th ed., edited by Jan Austin, 2-17. Washington, DC: CQ-Roll Call Group, 2011. http://library.cqpress.com/cqalmanac/cqal10-1278-70356-2371493. Example: "Border Security Clears During Recess." CQ Almanac 2010. Ed. Jan Austin. 66th ed. Washington: CQ-Roll Call Group, 2011. 2-17. 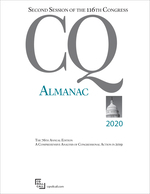 CQ Almanac Online Edition. Web. 26 Sept. 2011.